Well, yesterday was a two-press conference kind of day. As I wrote yesterday the first press conference was about transportation but kind of slid sideways when it was attended by some local seniors (in what I dubbed the "Occupy Willow Square" movement). I really enjoyed that press conference actually - I love to see passion and activism and democracy and community engagement. The second press conference is one I had known was coming for some time, but just hadn't known exactly when it would occur. I was very pleased to find myself in the Stonebridge atrium to see local businessman and city councillor Mike Allen announce his run at the nomination for the PC party in Fort McMurray-Wood Buffalo (which happens to be the riding I reside in, incidentally). I'd been watching Mike's progress as a councillor long before I met him. 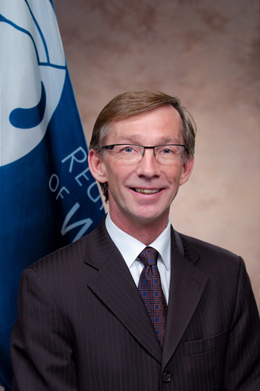 Mike is in his second term on council, and I'd always been impressed with his knowledge, intelligence, and understanding of the community. I was equally impressed by the experiences I'd had with the business he operates, Campbell's Music. And when I finally got to know Mike as a person earlier this year I learned that he is also just a pretty terrific guy. I think we all know a provincial election is looming in 2012. I think we all know that we face some serious issues in this region. I think we all recognize that we need strong representation, and that we need our voices heard in this province. I've already publicly declared my support for PC candidate Don Scott, as I believe in Don, his commitment to the community, and his integrity. I also believe he will get done what needs to be done for this area. And at this point I will also publicly declare my support of Mike Allen, too. It's for many reasons, including the belief that we need someone from the party in power as the representative in our region (and I just don't see that power shifting in this election). But it's for a lot of other reasons, too. It's about knowing that someone has the passion, commitment, vision, boldness, and integrity this area needs. I believe that Mike brings those things to the table. I believe that Mike will represent us - and me, a resident in his riding - very well. And quite honestly I would love to see both Mike and Don elected, representing us in Edmonton and bringing all those qualities I know they have to our government. I really only have one issue with all this. If both Mike and Don get elected - or if either of them do, really - then we lose councillors who have been so beneficial for us, who have worked so effectively for our community, and who have become an integral part of the smooth functioning of our local government. I've thought about this a great deal, actually, and I've come to a conclusion. While I would miss them being in our municipal government I'm willing to let them go. In fact, I'm working to make sure they do go. Not because I want them to leave - not at all. It's because I think they can do even more for us once they are in legislature. Losing them on the municipal level will be a blow, but it's for the greater good, so I can accept it. Because it's all about what is best for our community, and I truly believe that Mike Allen, who announced his intent to seek the nomination yesterday, and Don Scott, who announced his intention in late 2011 to do the same, are it. You may not agree with me, Fort Mac, and I welcome differences of opinion. This just happens to be mine, and as usual I am unafraid to share it with all of you. So, there it is. I'm looking forward to this nomination run, and to the following provincial election. 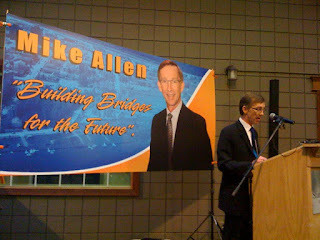 And after that I'm looking forward to building bridges with Mike Allen. I'm so very excited about the future for this community - and with representatives like Mike I think we can achieve amazing things. Frankly, I can't wait to see it!